Vandaag het gesprek met Nathalie Nahai. Dit is de 2e aflevering uit een serie van 2. Hier staat deel 1. Deze keer een aflevering in het Engels met Nathalie Nahai over online overtuigen. 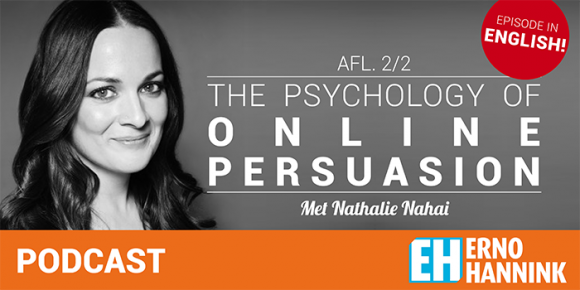 Nathalie is a web psychologist, international speaker and author of the best-selling book, Webs of Influence: The Psychology of Online Persuasion (Pearson). Nathalie lectures internationally on the digital application of behavioural sciences, host Guardian podcasts, and contributes to national publications, TV and radio on the subject of online behaviour. Veel plezier met de inzichten van Nathalie. It is good to have 1 salient button. Remember, the video must deliver the title. There are certain diffrences in your audiece, such as gender and cultural differences. They will react differently to the same ads.